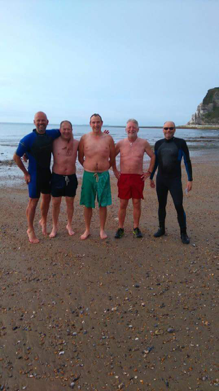 Apparently it was cold in the water, especially for those without wetsuits, but they all managed to avoided hypothermia and emerged from the sea, like something from a horror film. The Peaky Climbers then all went to breakfast and met up again with the young people and helpers from The CCT, again this was an opportunity for us all to get to know each other a little better and have a relaxed chat. After breakfast whilst the ‘young people’ were getting ready for the day, the Peaky’s headed off for a quick coffee at The Wonky Café in the beach at White Cliff Bay, before heading back to Kingswood for the mornings activity’s. The first activity being a number of blindfolded games, which finish with doing an assault course blindfolded, the young people were joined by Helen the volunteer nurse to CCT and Allen being encouraged to join in. This activity is designed to build trust within the group, and whilst Allen had full trust in following the young person in front of him he was soon “assaulted” by his fellow Peaky’s. Who found it amusing to pin him down under cargo nets and trick him in to climbing in tyres as well as tipping water over him. After the blindfold assault course there was a planned short break between activities which was filled with a not so short game of 4 square, a very popular game at Kingswood, not only did most of the young people get involved in this game, but so did the CCT carers, Kingswood activity staff and most of the Peaky’s. Whilst most were doing this the remainder had a break out and took the opportunity to talk further and learn a little more about each other. It was very inspirational talking to the young people and how positive they are, a lesson for all of us. 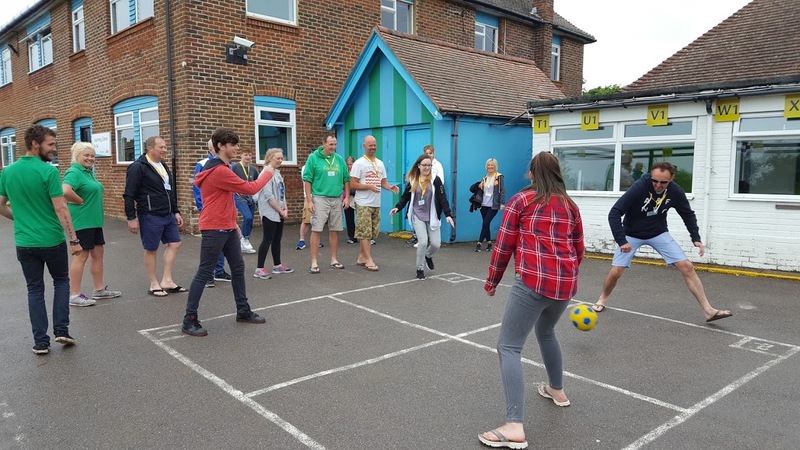 Eventually, everyone was persuaded to move on the next activities, which saw half the group play volleyball and the other half go to the 3G swing. The 3G swing was not for the nervous as it involves being hauled up about 30 feet in the air before releasing the clip to embark on a giant swing. There was much laughter (some of which was nervous) during this activity. Again the young people were keen for some of the Peaky’s to have a go after they had all finished. First off saw a nervous Mark and relaxed Ben take their turn, Mark made a reference to gardening after Ben started messing about, but he survived the experience. They were followed by Simon and Jai who took it all in their stride. Last to go was not so relaxed Nobby & Allen, there was some mention about feeling sick, but despite the excellent target that Mark made, the morning breakfast stayed put. The young people seemed to enjoy the anguish that some of the adults went through. With the mornings activities finished it was time for lunch, again this saw everyone mixing and enjoying each others company. After lunch it was time for the Peaky Climbers to don cycling clobber, pack vehicles and prepare to depart. But here was one last chance to get together for some group photos, which hopefully will be seen very soon, before saying our final heart felt farewells. I think I speak for us all, when I say the last few days were inspirational and the memories will be very motivating when we are cycling up the mountains in September, as well as all the training rides left before then. I think that we all hope that we get to another opportunity to meet again. Well a Peaky blog is not complete without some mention of cycling, so the stats for the day were 15 miles and 312 metres of climbing on our ride back to the ferry at East Cowes. As we arrived with time to spare a quick refreshment stop was made in The White Hart Inn by the ferry terminal. This visit resulted in a couple of the patrons making some donations, thank you gentlemen. Then it was time to board the ferry and bid farewell to the Isle of Wight, a place we will all remember with fondness. A massive thank you to Ian, Chris & all at the Caring Cancer Trust for such an inspirational weekend.